After the debut album was finished and released one of the members had to leave for the USA for about one and a half year. During this time the band continued to write songs and played numerous live shows, with their studio technician (now a full time member of the band) filling the spot. Also in this period the band attracted another band member to perform live bass guitar on stage. Together they worked on a new album which was finished after the lost member was back from the USA. 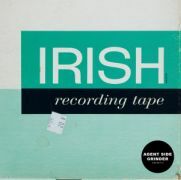 This record is ‘Irish Recording Tape’. 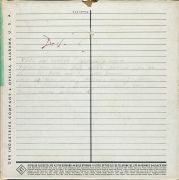 On this record the band has been perfecting their sound and song writing skills. Maybe the songs have been become more accessible in a way, but they still show the typical style of Agent Side Grinder: drilling industrial sounds which may be reminiscent at times of Swans, hypnotic synth sequences that refer to krautrock and psychedelic music and post-punk influenced bass lines which will give you flashbacks to Joy Division. See “Life In Advance” here… and watch the band at work in their studio. See “Die To Live” here… and watch a nice home made video.